One of the watercolor paintings from the winter. My own backyard. Ian and I had built this snowman. Ian did not like the idea of his snowman melting away. So, I made this picture so he will have good memory of his little friend (I had also taken some photos on my cellphone but I do not know if those photos will survive through phone and computer upgrades!). 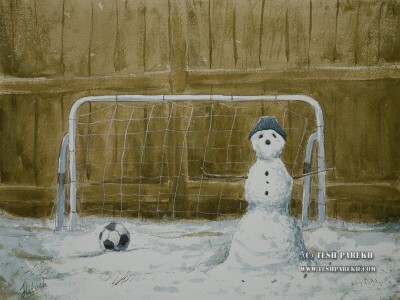 We built him near Ian’s soccer net so I though it will be fun to paint him as a goalkeeper! If you follow my work (I hope you do! ), you probably know that I do many paintings and sketches of Ian. I also paint things from his little world. He is six now and I have been painting him since he was a baby. It has been amazing to watch him grow. And as he has grown, so has my art. I use variety of watercolor papers. This one is painted on Arches 140 lb CP paper. I used tiny bit of gouache to paint the soccer net. At the size of 11×14, this was a quick painting.